We not only prepare beautiful food on site we also hire extra equipment for your event. Please see the list below and advise us upon booking if you wish to add any optional extras. Professional barista’s with coffee cart available upon request. The Prosecco Van will add more than just bubbles to your next function, wedding or event. A custom-fitted Piaggio Ape (pronounced Ah-pay), opening up to reveal a full on-tap bar beneath its canopy. 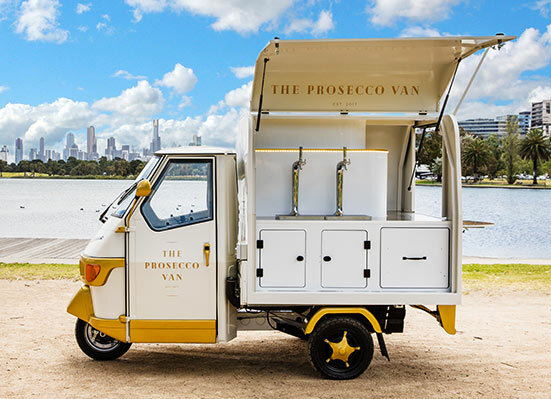 The Prosecco Van is the only type in Australia serving authentic Italian bubbles.